The wind was blowing twenty knots in the bay, we had all full sails up and doing eight to eight and half knots. I had just neatly caused an override on the jib sheet so we couldn’t furl the jib, and land was looming about 0.8 miles away. I was a little worried. Kristen luffed up into the wind to try and reduce pressure on the jib sheet, but as soon as the sails started to flog the sheets where whipping around like crazy, and it was definitely not safe to be prying fingers into knots. We fell off the wind to power back up. Me: "Kristen, what’s our depth?!?" Half a minute later, with no luck getting the override sorted out, me: “What’s our depth?!?" I kept looking at the sails, the mess of the override, and land. Sails, override, land. Sails, override, land! That morning we left Bahia Chamela at 9:20am, with a scheduled departure of 8:00am. That's about right for us. It worked out well, since the wind wasn't forecast to pickup until around noon. I am not a fan of using the engine, much to my families dismay. I find it hot, noisy, and a little stinky. They find sailing at two knots in a rolly swell very annoying and want to vomit. Luckily, they were not on deck as I stealthily setup the boat to sail with jib and jigger, no main, then raised the anchor by hand, and ghosted off in about six knots of wind. Despite the sweat and fatigue, it was beautiful. Raising the anchor by hand is a delight when you have some extra time, a cuppa joe, and not a whole heck of a lot of wind to make raising the anchor hard work. It feels like an honest way to handle a sailing vessel. But there is that space of time between when the anchor is raised off the bottom, leaving you drifting with the wind, and when you can secure the anchor, get sails set and the boat under control. It is an eery feeling, drifting towards rocks six hundred feet away, with the anchor not yet securely parked. How much time do you have before hitting something? A minute? Five? It all depends. In the light winds that we had today that was plenty of room and time to get the anchor up and secured, sails set and get underway. But what if you mess up? Forget a key line, trip and fall, or step in a pile of last minute dog poop? My backup plan is to scream really loudly, and hope someone down below can hear me. Clearly this manuver is best done with no boats around, and certainly not in an anchorage with boats downwind of you. We have done it both ways, and speak with hard earned knowledge. Fortunately I got the boat moving without a hitch, avoided the rocks by a healthy margin, set the auto pilot and got a third cup of joe. The family made it up top, and we sailed along at around four knots in seven knots of wind. It was very peaceful. Unfortunately as soon as we cleared the islands we felt the large swell from a big storm in California. There wasn't enough wind to keep us from rolling around, and it was a little uncomfortable for a few hours. Around noon stronger winds set in, around ten knots, we got the main up and Mango settled down to a nice downhill run making five to seven knots. At some point near the end of our sail but prior to entering the bay, I told Kristen about my desire to sail onto the hook, making an already good sail into a great one. Me: "How about when we come into the bay, if there are no boats in the anchorage, we start the engine as insurance, but we sail onto the hook?" Kristen, looking confused and a bit incredulous: "We already have a hard enough time anchoring with the engine." Me: "Well yeah, but we will have the engine as backup. We'll just sail on a reach, and when we get to a good anchoring spot, head up into the wind and drop the hook." Kristen: "But we cannot stop like that!" Me: "Well we would need a hundred feet or two to slow down. Into the wind. You know. Like physics." So I bided my time. 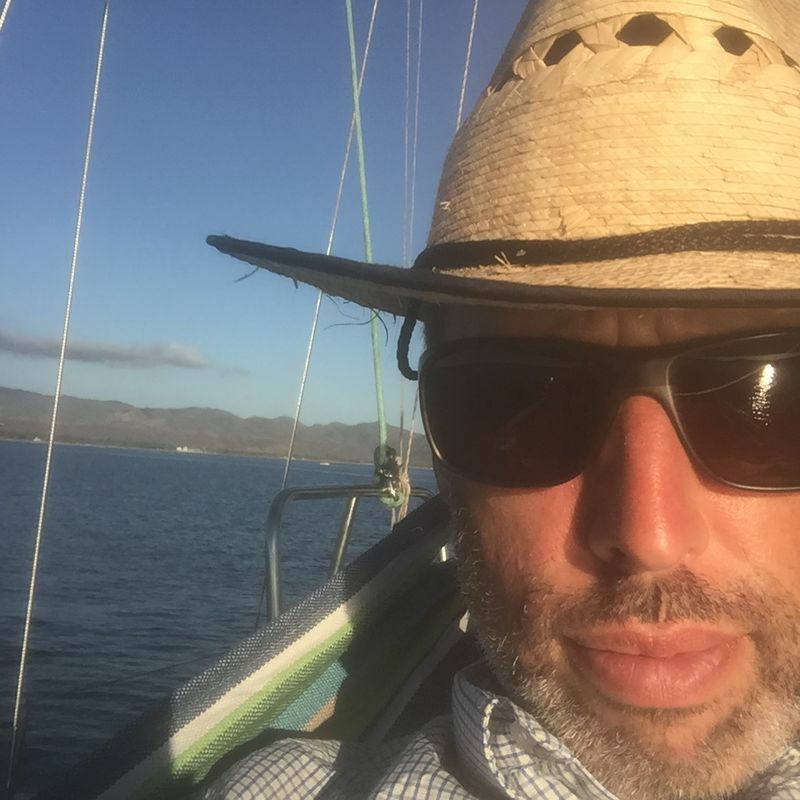 As we approached the end of our sail at Bahia Tenacatita, maybe five miles out, the wind picked up to around fifteen and were flying along between seven and eight knots. It was excellent! Binoculars out, I looked for signs of other boats in the anchorage, and several where there. No sailing onto the hook for us, especially in this wind. This dear wind that increased from fifteen just outside of the bay to twenty as we entered. Now twenty knots is a little much for our boat with all sails up. There is no danger, but the helm is slower to respond, and you can just feel the boat pushing up against her limits of speed. Normally we would either reef the main or drop it all together, but the swells were still high, and I didn’t relish going out on deck with the protection of the bay just a mile or two away. So we pushed on, just another mile or two before we are sheltered behind the bay and the swell dies down enough to make dropping sail a little easier. I had the brilliant idea to furl in the jib about a third in an effort to de-power the boat a bit. But as soon as that was one, the boat wanted to head up into the wind, severe weather helm, making it a nightmare to steer. The auto pilot had kicked out twice since the wind piped up, so Kristen was now hand steering. I let the jib back out, them trimmed the sheet to balance the boat out. Looking down, I saw the big fat jib sheet override. Normally I can see how the lines got tangled, but not this time. It was a goody! A sheet override is when one of the lines that controls a sail has wrapped under itself on the winch, usually in such a way that you cannot sheet in or out. You are stuck, and the sail is stuck where it is. Since this was the jib, and we need that sheet to run freely to furl it in, that sail, the big old 135% genoa, was stuck out, with the boat pounding merry along towards doom. With just a touch of frantic hustling, no panic mind you, I grabbed a spare bit of line to attach to the jib sheet prior to the winch, with the intent of then winching in the spare line and taking the load off of the jib sheet at the jib winch, so that I could then undo the big fat knot. Naturally this took about three tries to get right, all the while thinking, “sails, override, shore", and now “depth". I’m not sure how deep the water was when we got the jib free, but we didn’t seem to be dangerously close to land. Alarming, sure, but no danger. Besides, it was a beach shore with a nice hotel, so at least we would have had a softish landing and could have then hopped down and walked over for dinner. After freeing the override, we dropped the main, then furled the jib, and finally dropped the mizzen sail. It was a relief to have the sails in, running the engine. That sweet, sweet engine that I love so dearly. 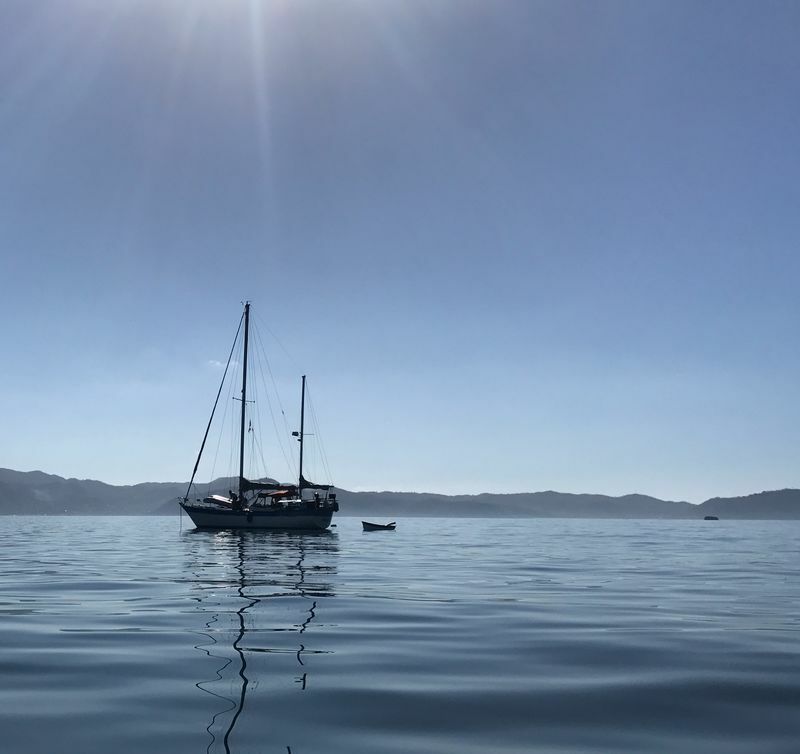 We dropped the hook, quite far from the rest of the anchored fleet, per our custom, set the anchor in about forty feet, and finally exhaled fully. Pop! Pop! go the beer cans, and we were, once again, in hard earned paradise.